Ambient music legend has released his second multimedia iPhone App, called Trope. The $4 touch-sensitive 'generative music application' allows you to trace shapes on your iPhone or iPod Touch, to the accompaniment of Eno's distinctive ambient sounds. Trope expands on ideas in Bloom, a iPhone App described as 'part instrument, part composition, part artwork'. The app lets you choose whether to actively create your own music by dragging your finger across the screen, or simply sit back and enjoy pleasantly trippy coloured visuals created automatically. You can select what types of shapes and colours Trope bases its artwork on, from a dozen 'moods' named after obscure aquatic micro-organisms. There's a shuffle mode and a sleep timer to lull you in bed, and if the lights and music are starting to freak you out by looking too much like Ann Widdecombe, say, you can simply shake your iPhone to start over. 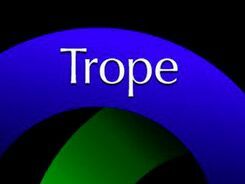 "Trope is a different emotional experience from Bloom - more introspective, more atmospheric. It shows that generative music, as one of the newest forms of sonema, can draw on a broad palette of moods," says Eno. No, we don't know what 'sonema' means either. And neither does the internet, it seems. Any ideas? Comment below!